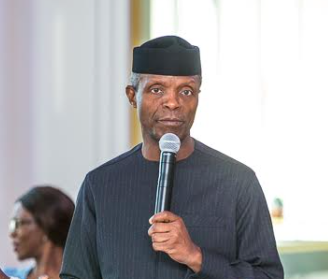 Vice President, Professor Yemi Osinbajo has urged major cement manufacturers to consider reduction of the price of cement in order to drive infrastructure development. Professor Osinbajo who made the appeal at the inauguration of the 350 million dollars BUA Cement Plant at Kalambaina, Sokoto State, said two things that require urgent attention in the cement industry was pricing and embracing usage of cement for constructing concrete roads across the country. “This cement plant will consolidate Nigeria’s self sufficiency in cement production, and boost the country’s status as a net exporter of cement. The significance of these cannot be over emphasised especially with the nation’s need to explore opportunities to diversify the country’s earnings away from oil” he said. He noted that after so many years of inadequate attention to national infrastructural development, the next few years will be defining for infrastructural development in the country, adding that, the National Integrated Infrastructure Master Plan estimates that an investment of about three trillion dollars was required to bridge the nation’s infrastructure gap. This, according to him, will also increase infrastructure assets from the current level of about 35 per cent of Gross Domestic Product (GDP) to at least 70 per cent by 2050. According to him, “to be where we ought to be in infrastructural development, investment in construction materials is crucial. Cement is of course literally the building blocks for much of the infrastructure that we need in Nigeria from houses to bridges, roads and dams to mention a few. It will also increase infrastructure assets from the current level of about 35 per cent of Gross Domestic Product (GDP) to at least 70 per cent by 2050”. The Chief Executive Officer (CEO), BUA Group, AbdulSamad Rabiu, said the project would not have been realistic without Federal Government’s efforts to initiate deliberate policies that support key industries in the real sector, from agriculture to manufacturing. He disclosed that through some of the policies, the Central Bank of Nigeria (CBN) provided adequate foreign exchange for import of machinery, which was helpful in completing the project on schedule.